Arriving in Santorini by ferry, docking at the bottom of cliffs that form its famous volcanic caldera, is breath taking especially late in the afternoon. But if you've never taken a ferry from the ports of Athens, it can be intimidating. Here is everything you need to know to island hop like an old hand. The first thing you need to know about taking a ferry to any Greek Island is that if you are a nervous traveler who likes to have everything pinned down, paid for and sorted well in advance, you probably should fly to Santorini. Schedules published in advance, online are not always accurate; they change at least annually and often seasonally. Cancelled sailings caused by last minute changes in the weather can scupper your tight schedule too. Travelers Tip: If you book a hotel independently and then fail to make a ferry connection for the day you are supposed to arrive, you'll still have to pay for your room. To avoid that eventuality, use a Greek travel agent to book both your hotel and your ferry tickets. The agent will then be legally obliged to get you to your vacation. Agents who sell only ferry tickets are under no such obligation nor are online, ferry ticket-only booking agents. There is a long tradition of travelers fetching up at the docks - everyone from student backpackers to luggage-laden families with children in tow — and getting on a ferry. If you can be a bit flexible and are willing to book your ferry a day in advance, in person — or even buy your ticket at the docks just before boarding, you should be fine. Except around the Easter holidays (Greek Orthodox Easter) and August, when Greek families take island vacations, foot passengers can almost always get on a boat. Travelers Tip: Always travel as a foot passenger. The ferry fare will be much cheaper and you can rent a car, a moped or a scooter very cheaply when you arrive. Besides, if you take a car by ferry to Santorini, you'll have to negotiate a terrifying road up the side of the caldera with seven hairpin turns. Traditional Ferries: Sea-going ferries travel between Athens and Santorini. These are modern cruising ferries that carry as many as 2,500 people as well as hundreds of cars and trucks. They have airline style seating, private cabins, restaurants and bars as well as some outdoor sundeck areas. They take anywhere from seven hours to almost 14 hours for a puddle jumper that visits eight other islands before it arrives at Santorini. You get the feeling of a real sea cruise. You can have a drink or a meal and do a bit of shopping. Most boats stop at several different islands before arriving at Santorini so you can have a quick look at how different they all are and see what portside life is like - though there is not enough time for you to disembark for a look around. You don't have to book in advance and can usually buy your ticket on the day of travel or the day before. There are only one or two sailings a day from any given company so if you have bought a ticket and then you miss your boat, you'll lose a whole day of your vacation. Speed Boats: Hydrofoil or jet ferries travel at speeds of between 35 and 40 knots. Most are catamarans though there are a few older jets that are monohulls. They can carry between about 350 and 1,000 passengers and some also carry vehicles. Depending upon how many island stops they make, they take between four and a half and five and a half hours. There are lounges where you can get drinks and snacks. They shave about three hours off your trip. They cost about twice as much as a conventional ferry. (See below). There is no outdoor space. You spend most of your time strapped into an airplane type seat. Because there is no deck space, you will miss the dramatic arrival at the bottom of the cliffs, one of the highlights of any trip to Santorini. Some people find the motion of the speedboats uncomfortable and motion sickness can be a problem. They are more likely to be canceled because of bad weather than conventional ferries. 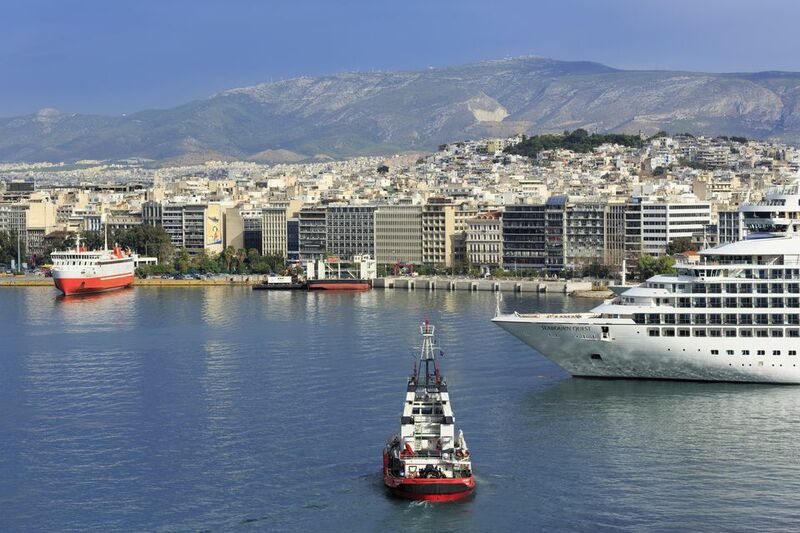 Piraeus, on the coast south of Athens, is the port most people choose. It is closest to Athens and has the biggest choice of boats year round. The Athens Metro Green Line goes from the city center (at Monastiraki) to Piraeus, with the station directly across the street from the main ferry terminal. The journey takes only 15 minutes and the fare is €1.40 (in 2017, for 90 minutes on any part of the public transportation system). Since the Athens Metro starts running at 5:30am, that leaves you plenty of time to get to the port, buy a ticket (if you haven't bought one in Athens or at the Airport already), have a coffee and board the earliest ferries (some leave at 7am and others at about 7:30). Rafina, north of the city, is only 10 miles from Athens International Airport and there is a bus service from the airport to the port. Rafina only serves boats for Santorini during the summer months, and then only two speedboat services a day. Hellenic Seaways operates a large conventional ferry from Piraeus, Monday, Thursday and Friday with fares starting at €19 for the nearly nine-hour journey. They also offer a high speed journey on the Hellenic High Speed, starting at €59, Thursday to Monday throughout the summer months. Zante Ferries run one island hopping ferry on Wednesdays. It's a nearly 14 hour journey and visits 8 other islands before finally arriving in Santorini. Fares start at €39.50 for deck seating - that means no reserved seats but you can sit in any public area. This one is a pretty long journey so it's probably worth investing a few more Euros for a reserved seat in a more spacious "VIP" lounge. SeaJets Run two high speed ferries a day from Piraeus, with fares between €58.80 and €69.70 depending upon the boat. In 2017 they also run SuperJet trips from Rafina during the summer months (most years). Golden Star Ferries run one high speed ferry a day from Rafina to Santorini. The trip takes six hours and costs €56. Unless you are determined to spend over the odds to save a few hours on a jetboat or a high speed ferry, booking your ferry a long time in advance is unnecessary and often not even possible. Ferry booking websites and ferry websites often contradict each other, are incomplete (or the information available in English is incomplete) and are notoriously unreliable. At the airport There is a ticketing agent in the arrivals hall at Athens International Airport. Aktinia Travel Services is open 24/7, can get you information on the latest scheduled departures and sell you tickets. All over Athens You'll find branches of travel agents and ticket agents around the tourist areas, near Syntagma Square and probably near your hotel. Look for the Amphitrion Agency, they have offices in Athens city center and in Santorini. Or just ask at your hotel for the nearest reliable ferry ticket seller - they really are everywhere. At the ports The ferry companies maintain ticket offices near the docks and there are literally dozens of ticketing agents on the ground near the boats. In Piraeus, there is even a ferry ticket seller in the Metro Station and one right outside.